Sepi and I went to Southern California not last week but the week before. I already posted about going to Norman’s Rare Guitars and I hope to do a whole post on her nephew Jon’s recovery from surgery. But a thing happened on the way back. We stopped to get gas at one of those places along I-5. They’re not really truck stops. Maybe one gas station caters to trucks but there are three or four others. There were some fast food restaurants. We wanted to eat but not fast food. Our choices were Denny’s or Harris Ranch. We chose Denny’s because it was on our side of the freeway. We parked carefully right in front of the front door. We chose seats so that we could easily see the car. After our food had come, we noticed that a family was out there milling around their car. At one point, the young boy – about 10 – went over to my car and looked right in the window. He was just a kid, but still . . .
My first thought was the Tele. I walked around to the other side and looked in. The Tele was still there. I thought everything was still there, but then I realized that my back pack had been in the back seat . . .
. . . and now it wasn’t. 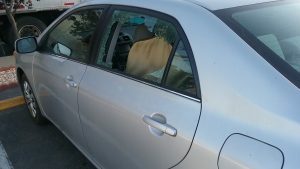 It turned out that the other family had had their car broken into in the same way. The two kids were wailing over the loss of their iPad and Kindle. 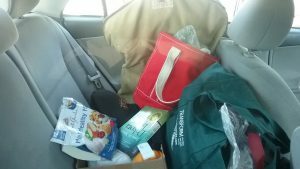 The Mom kept telling them, ‘It’s just stuff.’ I thought that was awesome. My wallet was safe in my pocket but the backpack had some stuff in it: my iPad, my voice recorder, a headlamp, some memory sticks, my work IDs, my headache pills. Losing that stuff didn’t bother me that much. But the backpack was Zach’s and I had kept two of his special pens in it. Now they’re gone. That bothered me. All the way home I stewed about it, but ultimately I realized that this is the universe telling me to move on. I filled out a police report. I talked to the insurance agent. There is a minuscule chance that I will get Zach’s backpack back. Minuscule here really means none. I’m moving on. It’s one more step. PS. 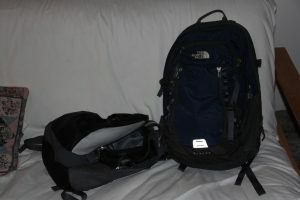 I looked up my earlier post about Zach’s backpack. It’s not bad. Check it out here.